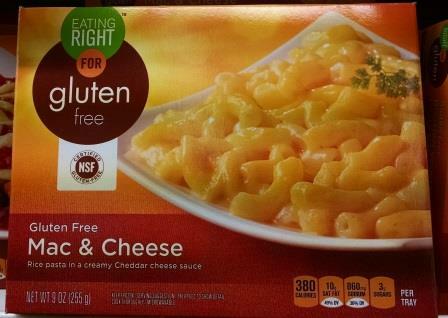 Okay, I’m not really sure how I feel about Eating Right’s Gluten Free Mac & Cheese. The consistency of the pasta is very good. The cheesy flavor is pretty good. It’s the consistency of that cheese sauce I’m just not sure about. It’s not really all that smooth. It’s sort of “particle-ish” in a sense that it’s not gritty, but you can feel the particles in your mouth. Maybe it’s my microwave, or maybe the ingredients separated somehow. I don’t know. But I’m not a big fan of it. It costs $2.99 (regular price) at my local Safeway. Considering the consistency issue and the heavy duty not-so-healthiness of it, I’ll pass on this next time. I only tried it so I could report back to you-all. Yeesh, I took one for the team. You’re welcome.